The state responded to the initial protests with arrests, tear gas and other forms of repression. In many cases peaceful protests turned violent; government buildings have been attacked, occupied, sometimes torched. Tens of thousands of protesters have demanded nothing less than the complete resignation of everyone at all levels of government from all parties, which they see as equally responsible for the massive multi-decade theft of people’s assets by the three wings of the nationalist oligarchy – Serb, Croat and Bosniak (Bosnian Muslim) – which have run Bosnia as their fiefdom since being granted it in the US-engineered Dayton Accord that ended the Bosnian war in 1995. The main, if not only, form of theft that has sparked off the uprising is called privatisation. Mass lay-offs, new owners stripping assets and declaring formerly well-functioning state firms “bankrupt”, workers cheated of retrenchment packages, workers still at work not getting paid for months on end? Sound familiar? Some like to call it “illegal” or “corrupt” privatisation, but for millions of workers around the world it is just called privatisation, or better still, capitalism. Perhaps not. But what workers’ revolution begins in some kind of pure form that can instantly be recognised? Gordy’s otherwise excellent prose notwithstanding, he does neither himself nor the Bosnian working class much justice with this intrusion of cynicism. Whatever the current uprising is or is not, it is the largest mass outbreak of unalloyed class struggle revolt, untouched by nationalist poison, that we have seen in Bosnia since it was ripped to bits by Serbian and Croatian nationalists – i.e., the new Serbian and Croatian bourgeoisie which had arisen on the corpse of Yugoslav “market socialism” – in the early 1990s. And this is all the more significant given that the multi-ethnic Bosnian working class, in the great industrial centres of Bosniak-majority central Bosnia, was the living heart of the best traditions of multi-ethnic socialist Yugoslavia, and it is in these same centres that the current revolt has broken out. And their demands indicate that some of the most powerful aspects of the ideology of that Yugoslavia – workers’ self-management of the factories, and radical social equality – have resurfaced, perhaps never buried very too deeply in the consciousness of the people. Let’s just look at some of the key demands put forward in the “Declaration by Workers and Citizens of the Tuzla Canton” on February 7. While the call for “a technical government, composed of expert, non-political, uncompromised members who have held no position at any level of government” may sound naiive to anyone that has experienced unelected, neoliberal “technical” governments in Greece and Italy, the protesters see this as merely a temporary government to get them to elections, and moreover it would “be required to submit weekly plans and reports about its work” to “all interested citizens”. This demand for such constant public oversight of the government – borne of the experience of decades of detached and arrogant rule by the three “ethnic” wings of the Bosnian oligarchy and suggesting a form of “people’s power” – already looks far in advance of these other so-called “technical” governments, and certainly coming from a different direction. After decades of neoliberal onslaught, both in practice and at an ideological level, for a rising people to demand privatised factories be “returned to the workers” is an extraordinarily refreshing moment. It should be remembered that even neoliberals and free marketeers can pretend to get behind campaigns against “illegal” privatisations in order to safely steer them in their ideological direction – they claim all the problems are caused by the “corruption” of the process, or “lack of transparency” and that indeed the problem isn’t the free market, but that the market is allegedly still not free or “perfect” enough. For example, in an otherwise useful article that details the theft, Aida Cerkez, writing for Associated Press, tell us that “more than 80 percent of privatizations have failed” as well-connected tycoons have swept into these companies, stripping them of their assets, declaring bankruptcy and leaving thousands without jobs or with minimal pay”. Failed? More like succeeded. A demand for factories to be returned to the workers – i.e., to their rightful owners – cuts across these neoliberal illusions, doesn’t allow them the time of day. Further demands include “equalising the pay of government representatives with the pay of workers in the public and private sector” – a demand that has rarely been heard since Lenin wrote State and Revolution in 1917 – as well as elimination of all kinds of special and additional payments to government representatives (eg, for sitting on committees etc.) and “other irrational and unjustified forms of compensation beyond those that all employees have a right to”. Similarly, in Sarajevo, citizens demanded, along with resignation of everyone in government from all parties, release of arrested demonstrators, an end to the “larceny of society cloaked in politics” and criminal prosecution of those responsible, that society begins “conversations and actions at all levels of government in order to establish a more socially just order for all social strata; and for all those whose human dignity and material basic needs have been endangered or destroyed by the transitional theft, corruption, nepotism, privatisation of public resources, an economic model that favors the rich, and financial arrangements that have destroyed any hope for a society based on social justice and welfare” (http://www.jasminmujanovic.com/1/post/2014/02/the-demands-of-the-people-of-tuzla-sarajevo-english.html). So while it may not yet be the “workers’ revolution” promised “in 1844”, it would be hard to disagree with Bosnian activist Emin Eminagić that this upsurge “could be the long-awaited opportunity to reintroduce the notion of class struggle into Bosnia and Herzegovina's society, moving away from the nationalist imaginaries of political elites”. “We are hungry in three languages” explains a banner in demonstration in Zenica. It is extremely significant that there has been no trace of nationalist poison in any of the demands of the rising people. Nationalism was a product of rising capitalism within the Socialist Federal Republic of Yugoslavia in the 1980s – the ideology of the rising bourgeoisie in the dominant nations, especially Serbia, Croatia and Slovenia – as they threw off the shackles of the Communist ideology, under the leadership of Broz Tito, of “Brotherhood and Unity”, i.e., working-class solidarity between the various nations that made up the federation. Bosnia was the hardest nut to crack, because while the five other republics within the Yugoslav Federation represented, however imperfectly, five different Yugoslav nations, Bosnia was the only fully multi-ethnic republic – a republic completely mixed between Serbs, Croats, Muslims (Bosniaks), “Yugoslavs” (i.e., those of mixed birth or who chose not to use an ethnic identifier) and others – it was Yugoslavia itself writ small. And likewise, the working-class cities of central Bosnia were in turn Bosnia’s heart – where workers of all these ethnic groups worked in the same factories, lived in the same apartment blocks – how were the new nationalist bourgeoisies to divide them? And yet divide them they – both these nationalist bourgeois cliques in neighbouring Serbia and Croatia, and the western imperialist powers – had to do; because a working class united across ethnic lines was not going to be much good for economic “reform”, i.e., the privatisation/theft of what was then legally owned by the working class. Especially when this Bosnian working class had such a militant history of class struggle. Indeed, it was none other than the miners in this thoroughly multi-ethnic city of Tuzla in northern Bosnia who organised collections and sent support to the heroic British miners’ strike of the 1980s. Not a tradition the British ruling class wanted to maintain at any rate; perhaps partly accounting for Tory-ruled Britain being the most solidly supportive of the demands of Serbian bourgeois nationalist leader, Slobodan Milosevic, to split up Bosnia into newly created, ethnically-cleansed statelets. The problem with splitting Bosnia along ethnic lines being that people didn’t live in separate areas, but all together in cities, and in an interlocking, completely scattered patchwork in the countryside. Thus to create a “Serb Republic” within Bosnia as demanded by Milosevic, and likewise a smaller “Croat Republic” as demanded by his partner in crime, Franjo Tudjman of Croatia, required massive “ethnic cleansing”, in what became a euphemism for genocide. And the main victims of this were the plurality of the Bosnian population who were at once the most scattered throughout Bosnia geographically, the most urban-based and proletarianised, and who did not have a national “fatherland” outside Bosnia to arm them to the teeth – namely, the Bosnian Muslims, and the mixed Bosnians. And as the newly independent bourgeois states of Serbia and Croatia, via their massively armed local Bosnian proxies, began in April 1992 carving out their new “states” via ethnic cleansing, Britain and France enforced a criminal arms embargo on the Bosnian Republic, in violation of UN Article 51 on the right of UN-member states to armed self-defence, and in defiance of overwhelming votes in the UN General Assembly for this embargo to be lifted. Britain and France demanded nothing less than Bosnia’s surrender, its capitulation to one or the other of the unjust ethnic partition plans they continually proposed. Bosnia’s multi-ethnic government – led by Bosniaks and anti-nationalist Serbs and Croats at all levels – rejected these demands for ethnic apartheid and recognition of ethnic cleansing. While massively outgunned, it attempted to hold on at least the Bosniak-majority regions (the few it could defend against massive ethnic cleansing) and the mixed working class cities of central Bosnia. Once again, Tuzla, where the current revolt broke out, played a key role, alongside the capital Sarajevo, in maintaining a powerful multi-ethnic flavour for the resistance, not an easy task as over a million Bosniaks were driven into the small part of Bosnia still controlled by the government, from the 85 percent of the country which had been conquered and “cleansed” as Serb and Croat “republics”. In the end it was US intervention in late 1995 – following three and a half years of slaughter – that granted half of Bosnia as an ethnically cleansed “Serb Republic” (RS), though Serbs were only one third of Bosnians, to the regime of the right-wing Serb Democratic Party (SDS), which had led the ethnic cleansing; the timing would almost suggest this was a reward for the SDS-led army having just committed genocide in the Bosniak town of Srebrenica, which was included in RS seemingly just as a matter of course. However, worried that granting a “Croat Republic” as well would leave a land-locked, poverty-stricken, revenge-seeking “Muslim state” in the heart of Europe, the US prevailed upon the Croat nationalists to accept a “Federation” with the Muslims in the other half. The Serb nationalists got what they had fought for, an ethnic republic in far more of the country than could conceivably be “theirs”; but they could claim they were short-changed by not being allowed to unite with Serbia. The Croat nationalists were not only denied the “right” to unite with Croatia, but did not even get their own republic like the Serb nationalists, and so considered themselves short-changed; but given the weakness of the Bosniak people and of the Federation as a whole, Croatia felt it had gained the same effective suzerainty over half of Bosnia as Serbia had gained over the other half, and used this to promote Bosnian Croat interests. The Bosniaks lost the war, in being forced to cede half the country to RS, with the sop that the other half could still be called a “Federation”, and so were now forced to play the same game, trying now to compete with the Croats to dominate the Federation, where they at least had the advantage of numbers. Importantly, this “Federation” was no real concession to multi-ethnicity; not only had the damage been done, and rivers of blood divided these two populations (and both from the Serbs), but moreover the entire constitution of Bosnia was re-written to create ethnic quotas at every level of government, in both halves of the country, from the municipal level right up to the weak federal government. And levels there are: as Cerkez explains, “nearly 4 million people are governed by more than 150 ministries on four different levels of government”. And on top of this morass of ethnic-based politics, an international overseer – the High Representative – was appointed to be the final arbiter of politics in Bosnia – and to represent the interests of western capital, the European Union, the International Monetary Fund and the World Bank as they attempted to push a neoliberal economic “restructure” on to the battered country: such issues as overall economic direction were never to be up for popular vote. And so in peace, the policy of national division became dominant; and so every political issue that arose could become diverted into the nationalist box; every election, at every level, became a forum for the ethnic bourgeoisie to try to grab more of the spoils while spouting ethnic lies to their impoverished and frightened constituencies, while in the end, to form governments, grotesque coalitions of ethnic-based parties came into being, often mutually hostile, but competing with another such unprincipled bloc, a recipe for permanent dysfunction. So while the Bosnian Serb, Croat and now Muslim bourgeoisie stripped the economy and thieved the people’s assets – as required by neoliberal “economic reform” – there could always be someone else to blame, another national group ready to take away the (unequal) “rights” they had all achieved at Dayton, in order to prevent the battered working people from putting the blame on their “own” thieving class. Indeed the very lopsidedness of the Dayton set-up aggravated this ethnic politics. RS leaders could continually threaten to leave Bosnia and unite with Serbia, knowing full-well it was impossible; Bosniak leaders could threaten to try to get RS abolished, again knowing it was impossible, however morally correct it may seem in the abstract – in practice, as a form of threat, it could only act divisively now the deed was done; Croat leaders could threaten to split the Federation and form a third, Croat entity. And then they could each scare and homogenise their “own” people with these threats of what the other group might do. Thus the significance now of today’s non-nationalist demands, not to mention ones which call for factories to be returned to the workers. In fact, this is not the first action cutting across ethnic lines – last June’s “Babylution” was a precursor, a brief multi-ethnic mass protest against the incredible dysfunction of a system in which parties and state agencies were unable to reach enough agreement to issue identity documents to babies, which led to the death of a child unable to cross the border for urgent medical treatment. But that brief moment has now been overshadowed by the current mass revolt. Why is most revolt taking place in the Bosniak areas? But a question then arises – why has the uprising largely taken place in the Federation, and even within the Federation, overwhelmingly among the Bosnian Muslims? In fact, it hasn’t been only Muslims – there have been smaller outbreaks in RS, particularly in its capital Banja Luka, and indeed the people of Prijedor put forward a similar list of demands to those in the Federation cities; and within the Federation, Mostar, a city divided between Muslims and Croats, has also been impacted. But overwhelmingly it is the case. After all, the venality, the corruption and the theft have been no less obvious in RS than in the Federation; in fact the propensity of RS leader for many years now, Milorad Dodic, to farm out contracts to friends and connections is notorious. For example, the proceeds from the 2008 sale of RS Telecom were used to set up the Investment-Development Bank, supposedly to help citizens buy homes or small businesses to expand by lending at low interest rates, but most of its largest loans were given to “foreign-backed companies with offshore bank accounts and assets that exist only on paper”, largely companies with ties to Dodik himself or his regime, including $2.2-million loan for a business run by his son. Dodik himself personally signed off on all these loans. At one level, the answer is easy: this is a working class uprising in the big industrial centres most impacted by neoliberal “restructuring” and privatisation/theft; and Muslims dominate in these cities. Of the twenty largest cities and towns in Bosnia, fifteen are in the Federation. There are however other factors. First, the RS is probably slightly better off at the level of functionality. In its great wisdom, the international overseers of Bosnia carried out a “decentralisation” of the Federation mid-last decade, splitting it into ten cantons, while leaving RS as one entity. Now, while “decentralisation” might sometimes be a good thing, in the circumstances all it meant was a decentralisation of the already cumbersome ethnic-based bureaucracy: a proliferation of the problem, with vast extra layer of competing “ethnic” bureaucracies now running lots of new governments. But this “cohesiveness” of the RS, while better in some ways, is also based on the less democratic and more uniformly nationalist nature of RS; even the competition in the Federation between Bosniak and Croat parties, however venal, and the remnants of officially non-ethnic parties from the past, however unreal, offers some kind of break from the stultifying uniformity in RS. Even the differences between the different parties within RS are virtually non-existent, all based on the alleged need to “protect” the “Serb nation”, despite them getting the best deal from Dayton. It also means a more cohesive repressive apparatus. Which leads to the main point: reactionary nationalism was always stronger among the Serbs and Croats, reflecting the real interests of their ethnic elites to try to carve out parts of Bosnia as their own and to link these to the outside “fatherlands”. This means that, despite the wear and tear, this nationalism still has something of a hold in their regions, enough to divert a section of the population. Thus the reaction of RS leader Dodik to the uprising in the Federation and even its tentative spread to RS was to denounce the whole thing as a plot to abolish the RS; and while this may seem self-evidently absurd, when protesters turned up in the RS city Prijedor to make the same demands being made nation-wide, across the road a counter-demonstration raised hackneyed old nationalist slogans. 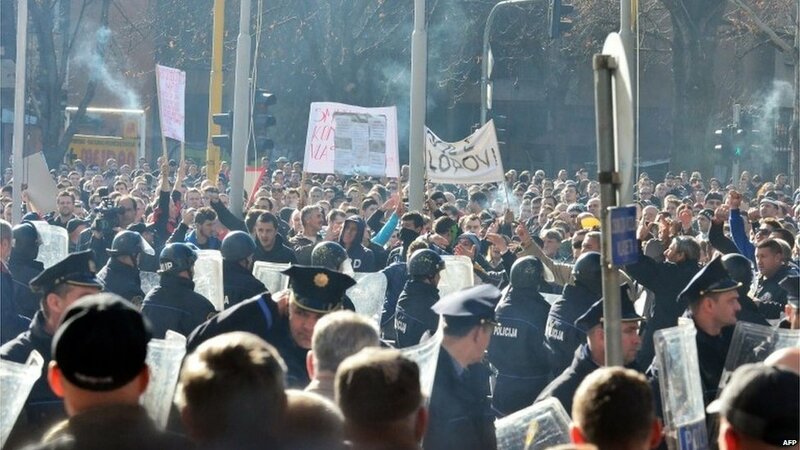 Same in Belgrade in Serbia itself: one demonstration in solidarity with the Bosnian uprising, opposed by a counterdemonstration supporting war-criminal former general Mladic. If such a thesis is repeated for years in almost all media in Republika Srpska, the fear is understandable. Such a narrative eventually produced paranoia -- systematic and planned. I would even say such paranoia was produced by the authorities themselves because it is easy to direct public attention there than to solve the problems in the economy, the health system, education and such normal problems. Here is still easier to be poor and hungry then be traitor. Because if you are poor and hungry, you are at least not contemptible. In contrast, while the Bosniak elite inevitably became an eager player in the national game after Dayton, this nationalism was never more than skin-deep among the Bosniak masses, particularly in the industrial centres. As explained above, their survival as the most scattered and the most urbanised, yet also militarily and economically weakest, group required the maintenance of a multi-ethnic republic, meaning that even the aspiring Bosniak bourgeois elite had little use for nationalism which could only benefit its opponents. Thus, when British and French and UN “diplomats” continually tried to force ethnic partition plans onto Bosnia during the war, drawn up in consultation with Serb and Croat nationalist warlords, the inclusion of a “Muslim” statelet alongside the Serb and Croat statelets was the aim of the Muslims’ enemies, not their own; a land-locked apartheid ghetto into which all the ethnically-cleansed Muslims from the rest of Bosnia could be driven into. Thus when the Bosniak leadership finally accepted such plans under the pressure of genocide, strangulation sieges, embargo etc, it was in the form of national capitulation, not a product of their own nationalism at all. And so if this nationalism then became necessary and useful for the elite after 1995, it never had the same sway over the masses as elsewhere. Thus it is no accident that, imbued by less nationalist poison, the Bosniak workers have led the way back to the slogans of self-management and internationalism. detergent, which damaged the machines they used, thus slowly destroying actual production capacities of the company … Until now, the workers are owed over 50 salaries, most of them cannot retire, as they are lacking several years of work service due to the privatization process that had been dragged on since 2002. One has to imagine such examples multiplied manifold. Yet while the ethnic-based oligarchies are to blame, their actions are only to be expected within the political order imposed by Dayton and an economic program driven through by the international caretakers dictated by the International Monetary Fund, the World Bank and the European Union. The latest IMF austerity program, imposed five years ago, froze budgets, slashed wages and veterans’ benefits and sped up privatisation, massively driving down consumption and doubling public debt. Bosnia was already in deep economic crisis, and as per the norm, the IMF “cure” was to make matters worse, by forcing already battered working people to pay for the theft of the new capitalist elite. The situation had been accentuated by the “free trade” policies imposed by the European Union as conditions for future membership, allowing foreign goods to pour in. As Andreja Zivkovic explains, “the economic model is based on opening up to foreign capital. Until 2008 foreign capital flows fed growth based on imports and consumer debt, but at the same time destroyed industry and created the present debt crisis. On the one hand, an overvalued currency pegged to the Euro enabled the borrowing needed to pay for imports; but on the other, it acted as a disincentive to investment in the real economy and made exports uncompetitive” (http://www.criticatac.ro/lefteast/break-with-dayton-bosnia). In particular, free trade agreements with neighbouring, richer, Serbia and Croatia in 2001, negotiated by their ethnically-connected Bosnian elites and approved by the EU as a kind of “apprenticeship” for full free trade, proved disastrous. By 2004, Serbian and Croatian products were dominating the markets in the two halves of Bosnia – ironically, it was easier to trade “free” across the official Bosnian borders than for the two halves of Bosnia to trade with each other. With Serbian and Croatian capital also grabbing assets in the two halves – for example, the 2008 sale of RS Telecom to Serbian capital – one might say the two neighbours were seeing the economic fruits of their victory in the war. As Bosnian agriculture collapsed under the weight of these imports, in 2005, hungry farmers from both sides of the divide set up a protest camp outside Sarajevo and camped there for many months – and were ignored. At the time the IMF program was imposed in 2009, the somewhat more democratic environment in the Federation made it the centre of resistance. While RS had already carried out significant privatisation, the Federation was far behind; and meanwhile, benefits for disabled veterans were 10 times higher in the Federation than the pittance they were getting in RS, making massive cuts a centrepiece of the IMF program. The IMF demanded cuts of 207 million euros from the Federation’s budget, some 10 per cent of its entity, cantonal and municipal budgets, while RS had to cut 73 million euros. Despite general strikes and massive veterans’ demonstrations in the Federation – veterans threatening “social revolution” – the IMF program was driven through in slightly amended form in June that year. Yet given the moral weight of the veterans – who had defended Bosnia through the darkest years – the Federation parliament then rejected the legislation to cut veterans’ benefits by 10 percent in October. Ironically, the fact that the RS budget was at that point experiencing a one-off windfall from its Telecom privatisation helped the argument that the RS’s more successful privatisation was a good thing. Naturally, this could not be repeated as the state lost these constant revenues, and the effects of the ramping of privatisation in both entities since 2009 speaks for itself – including what happened to the proceeds of this privatisation, as explained above. In this context, the threat by Valentin Inzko, the international “High Representative” or grand vizier of Bosnia, of intervention by EUFOR (European Union) troops “if the hooliganism continues” is entirely understandable from the point of view of the imperialist overlords and their system of neoliberal pillage, gravely threatened by a horizontal, class-based uprising evoking the best of the socialist past. In this sense, the Bosnian workers are in the same boat as the Greek workers who have been resisting the catastrophe imposed on them by the same system. This may come as a surprise to some liberals who see the international presence as a balance against the competing nationalist oligarchies. It is true that, given this ethnic partition and dysfunction, the international overseer may appear the only unifying factor. However, the Dayton constitution means the HR must work through these oligarchies, while trying to smooth over any serious division; ultimately, European and US capital, which the HR represents, has only these oligarchies to work with to maintain capitalist rule. Thus when one faction or another of the ethnocracy steps too far out of line, threatening the entire Dayton order, they may be sanctioned or even sacked or jailed by the international vizier. This occurred, for example, in 2001, when then Croat member of the presidency, Ante Jelavic, and his Croat Democratic Party (HDZ), attempted to split the Federation by organising a referendum to set up a third, Croat, entity within Bosnia. He was sacked by High Representative Wolfgang Petritsch, while NATO-led Stabilization Force (SFOR) troops raided the Hercegovacka Bank, which he was using to finance the referendum, froze its accounts, seized documents and closed down most of its operations. Muslim and Serb leaders have similarly been sacked or threatened. But these actions are, on one hand, exceptional, and on the other, they allow the ethnocracy to demagogically pose as the victims of foreign colonial rule and thus keep alive “ethnic” politics. This ultimate foreign sanction thus acts to prevent not only mature independent institutions, but also the development of a real democratic alternative to the ethnocracy. The fact that these international sanctions don’t include action against the “regular” economic crimes that the nascent capitalist classes are expected to carry out in the neoliberal EU is highlighted precisely by this threat of intervention against the working class uprising: the class interests of all wings of the oligarchy and international capital are paramount. “Valentin Inzko: Useless clown” reads one protest banner. protesters together is a radical demand for justice”. Of course the so-called “ethnic passions” were never only that in the first place, and even at their height represented the new class forces that were burying the corpse of “market socialism”. He is quite right, of course, that the last 20 years of “liberalism”, presumably meaning a mixture of the capitalist market with elite bourgeois democracy, has only perpetuated these “ethnic passions” rather than overcoming them. How could it be otherwise? Despite the ascendancy of the ideology of singing the praises of “the market”, not just among reactionaries but also among most stripes of left-liberals ever since the collapse of the grotesque Stalinist aberrations of socialism around 1990, it is nothing but a system of ruthless dog-eat-dog competition for survival, however much it may be supplemented by band-aids, liberal anti-corruption wish lists and chatter about “civil society” for the comfortable middle classes, while the working classes retrenched from and plundered by the “liberally” privatised enterprises are sent to hell. This liberal ideology has had an unexpected staying power – countless times throughout the world what have begun as genuinely popular upsurges, featuring the same “radical demand for justice”, have been side-tracked into the liberal morass. As noted above, this often takes the form of explaining that the privatisation and neoliberalism that are the targets of the upsurge would be perfectly fine if only they had less corruption, more “transparency”, more “accountability”, the involvement of “civil society” and so on. Rather than privatisation – i.e., capitalism – itself being the problem, the problem is the incompleteness of the privatisation, its impurity, the fact that it is still mixed with “corrupt” state interests and the like. As if there were another form of capitalism. As if their “pure” version even existed, let alone had any answers if it did. In the case of Bosnia, the “ethnic” corruption of the process. As if there is another way. Slogans such as “return the factories to the workers” are declaring all this to be rubbish. Does that mean it is impossible that this upsurge too can be diverted? Who would want to make such a brave prediction. In fact, even the “factories to the workers” slogan is more a specifically Tuzla phenomenon – while all the protest demands feature issues of radical social equality, right to work, reversal of thieving privatisation etc, only the Tuzla workers have put up this ultimate demand. We can certainly say that the “ethnic” stranglehold over the militancy of Bosnian workers has been broken, and this is significant enough, and that some of their slogans point towards a more significant break with the logic of capitalism. That this challenge has arisen in Bosnia is entirely logical. The socialist Yugoslavia under Broz Tito had many of the faults of the other eastern European regimes, including being run by a massive privileged bureaucratic caste which repressed genuine opposition; and where it was different, in its “market” version of socialism, this was unable to escape the logic of break-neck competition, economic anarchy and unemployment that characterise “market capitalism”. On the other side, however, Yugoslavia always had a more politically liberal atmosphere than elsewhere in the east, and above all its unique doctrine of “workers’ self-management” of the factories, and “social” property – the liberation of the means of production from bureaucratic control – is a powerful legacy that lives on in the consciousness of working people. A possibility, an image, of a different world (regardless of the fact that these worker self-managed enterprises at the time were undermined precisely by being thrown into the world of “the market”). Thus it is not only the call for factories to the workers, but in particular the word “return” – they were ours, after all. Nevertheless, even if the workers in Tuzla were to physically re-take control of their enterprises, this example would need to spread elsewhere in Bosnia, and indeed elsewhere in the Balkans, for it to have a chance of posing a new socially just order. In Greece, for example, the lull in the movement against EU-IMF imposed socio-economic catastrophe that was experienced through 2013 was broken when the workers at Greek Radio-Television (ERT) took over their own enterprise when the regime tried to close it. It became a rallying point, a source of hope, an example of a different way. But after several months, it could no longer survive on its own. Even if the protests gradually lose their power, they will remain a brief spark of hope, something like the enemy soldiers fraternising across the trenches in the first world war. Authentic emancipatory events always involve such ignoring of particular identities. This is well said, with the necessary addition that the “spark of hope” we are speaking of here is not only this ignoring of “ethnic” identities but also the clear pointers towards a new emancipatory socio-economic order.